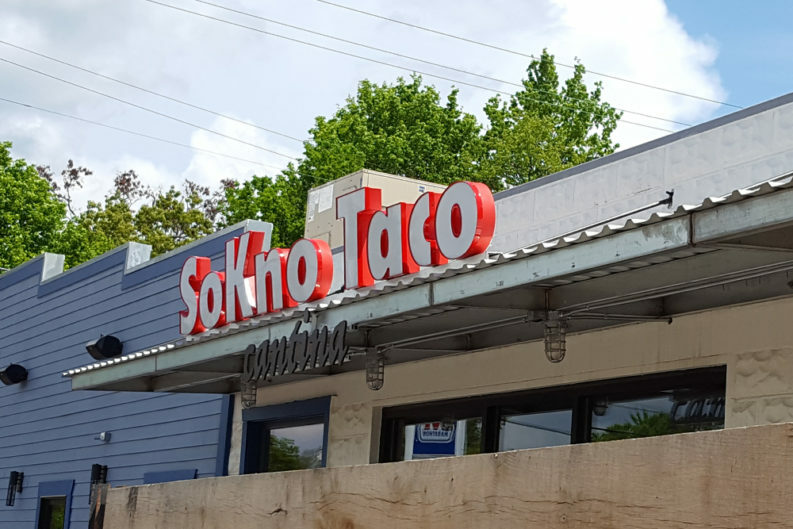 If you ask Google to direct you to the SoKno Taco Cantina, it will almost inevitably take you there via James White Parkway and Moody Avenue, which is an efficient way to travel to this shiny new gem across the river. But someday, you should consider my preferred route along Sevier Avenue, where you may be waylaid by the worthy temptations of Honey Bee Coffee or Alliance Brewing. This out-of-the-way path showcases one of the most likable things about South Knoxville: the experience of seemingly rural routes emerging suddenly into brief but charming village-like moments of commerce. One of my favorites from youth was on Martin Mill Pike where Pease Furniture seemed to leap out of the woods to offer you a really comfortable easy chair. If you head to SoKno Cantina by way of Sevier, you’ll find what feels like a tiny village square formed by Al’s Market and Deli and a firehouse with a baseball field behind it, just before you cross Baker Creek. Then Sevier becomes residential long enough for the sight of SoKno to emerge like a beacon. Along with the legendary Round-Up Restaurant across the street, the sudden appearance of these places where people gather is exciting and, for me at least, stimulates the appetite like nothing else. Many of my trusted eating clan have been positively giddy since the opening of this busy eatery—one of them practically crowed that he’d been forced to wait (happily!) for a table in South Knoxville. And it is, in fact, a tasty oasis in the Urban Wilderness. The decor is of that industrial chic—a style that has become a little too ubiquitous for my personal taste, though it works perfectly here. I imagine that the urban neo-garage feel as right to the young diners who wear vintage eyeglasses and newly colored tattoos as it does to folks who spent time hanging out in my cousin Leonard’s motorcycle garage deep in South Blount County. It’s pleasant and comfortable enough to keep the focus on the important stuff. Speaking of food, as you might suspect there are tacos on this menu, and the rumors are true: They’re good eats. You can also get burritos if you want—all you’re doing is picking your filling from the same set of taco stuffing in the lamentably named “Featured Meats” section, which either ironically or insultingly also includes the vegetarian and vegan options. But whatever you do, don’t overlook the very lovely tamale. You can order it on a platter or add it a la carte, neatly wrapped in foil and a corn husk. At the suggestion of the server, I had beef, though chicken is also available. 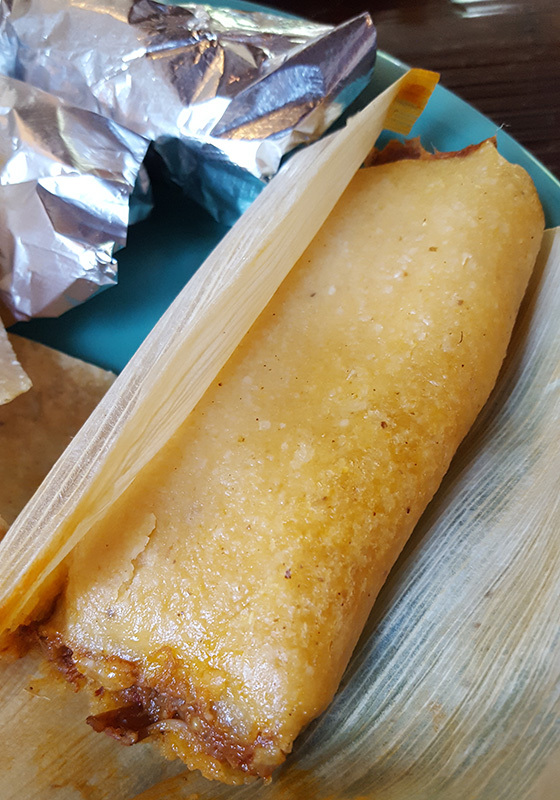 The first thing that struck me was that the tamale wasn’t steamed—or at least it wasn’t finished that way because the exterior was golden brown, and though not exactly crispy, there was an extra bite of texture to the exterior that thrilled my tactile obsession. Inside was a rich and nicely done beef braise, intensely flavored and impeccably tender; the surrounding dough was an accomplishment—like a good tamale ought to be, it was light but hearty and never pasty. Apparently, this beauty gets baked, which accounts for the excellent texture and color, and contributes to the ease of eating this joy by hand. 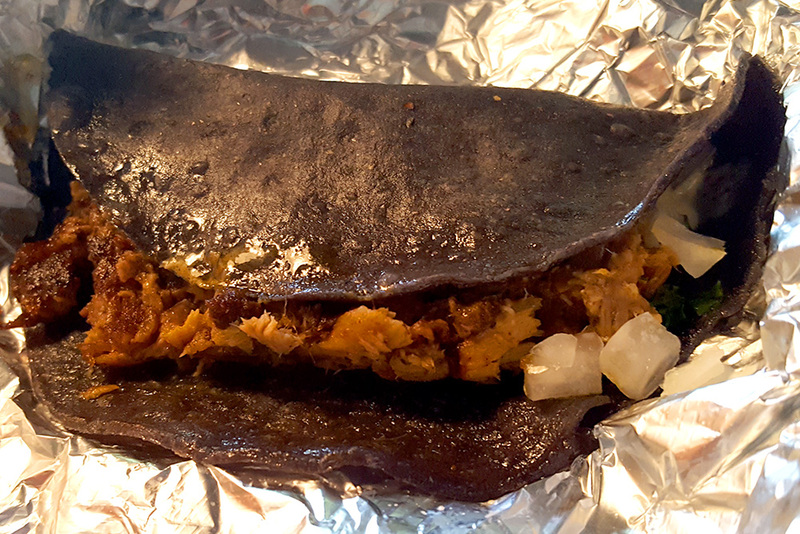 The tacos are a mixed lot, but the most important thing to know about them is that almost every one of them tastes better with a blue corn tortilla. It comes standard with the Thai portobello but otherwise costs an additional quarter—but really, you deserve it. Forget the case of Corn v. Flour; the texture alone wins the day. Sure it’s fried a little, but that brings out a special kind of toothsome bite, almost like a shell, but not that firm at all. Like the tamale, all those tacos come wrapped in foil—one shudders to think about how much of that metallic wrapping they’re throwing away. Is there really no other way to serve these little beauties? My favorite was the Mezclar La Carne, a blend of ground chorizo and beef—spicy with a light and lingering heat. Likewise, the carnitas taco was very tasty—the particularly tender and deeply flavorful pork is slow-smoked in-house. Both of these virtually cry out for the corn tortilla. The soft luxury of the filling needs (and is very well served by) that extra bite. No one ever actually offered me the choice, and I’m disappointed by that. Oddly enough, on my first visit, my editor sent me a text mid-meal suggesting the alternative wrapper; so, I had no choice but to over-eat in the line of duty. The one taco that comes in corn was also the most disappointing of the lot. The Thai portobello didn’t taste very Thai at all—I don’t know what’s in SoKno’s Thai house seasoning, but I think I’d bump it up with some curry paste. In a similar vein, the tofu taco was a letdown. Despite the putative inclusion of both roasted jalapenos and roasted red peppers, and tofu cubes that looked delicious, there wasn’t much action on the palate. That was true, too, for the El Pescado—the presence of mango-jalapeno slaw barely made an impact on the under-seasoned fish, which was supposedly blackened cod with red fish seasoning. That combination of words alone set my buds to tingle—perhaps it was too much expectation? El Camaron, however, came roaring back with flavor and texture—Diablo shrimp were perfectly cooked and seasoned appropriately to its nomenclature. Of course, this taco features both cilantro and cilantro sour cream, which give a pleasant frame for the other flavors. In this instance, I preferred a flour tortilla over corn for tactile reasons—the play of the firm shrimp against the soft tortilla was really cool, and I like the feel of a flour tortilla’s tender chew with sour cream. I didn’t order anything in platter form so I never tried the Fiesta Rice, though I was tempted by the Cast Iron Beans. Kitschy me hoped they would be served in a little skillet, but nope, they come in an honest little bowl draped in house queso. Well-cooked as they were and even cheese-laden, they didn’t do much for me. Perhaps I’m jaded by memories of other beans, other places, but my little bowl didn’t have any pop. 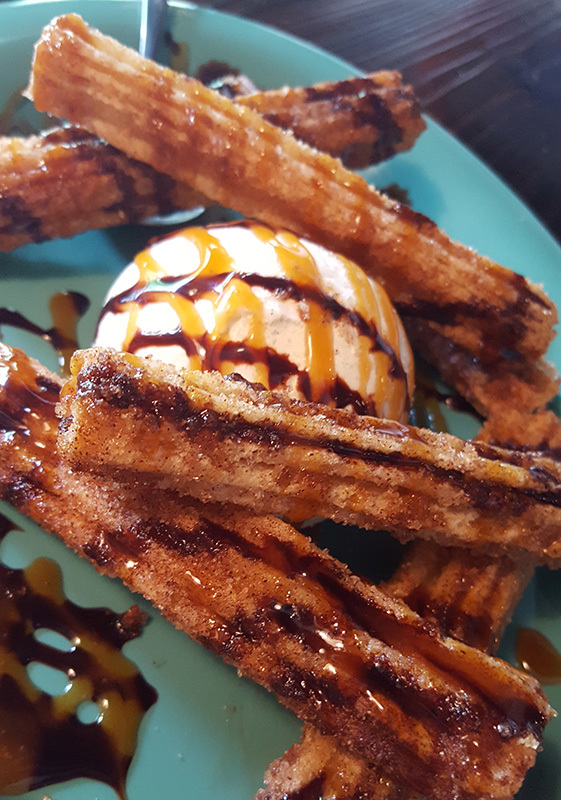 But I will forever order SoKno churros to end or even make a meal. These are the finest churros I’ve ever, ever, ever stuffed my face with. They may the best thing about the place. Perfectly fried to give extraordinary crunch on the outside but yielding to a soft, perfectly tender interior, they are the stuff of dreams. A coating of sugar gives an extra oomph to the first bite, and the light drizzle of chocolate sauce is perfectly portioned; and I know you may never believe me, but these don’t need a tub of melted chocolate. The little drizzle is fine because the pastry itself is heavenly. The ice cream cuts a fine figure on this plate—it’s not homemade, but it’s fantastically creamy and dense and makes a perfect foil for the light and crispy churros. Yeah, I’m a fan. And, really, I’m a fan of SoKno Taco Cantina. The food is fresh, mostly delicious, and best of all it sits beautifully in a beautiful part of town. 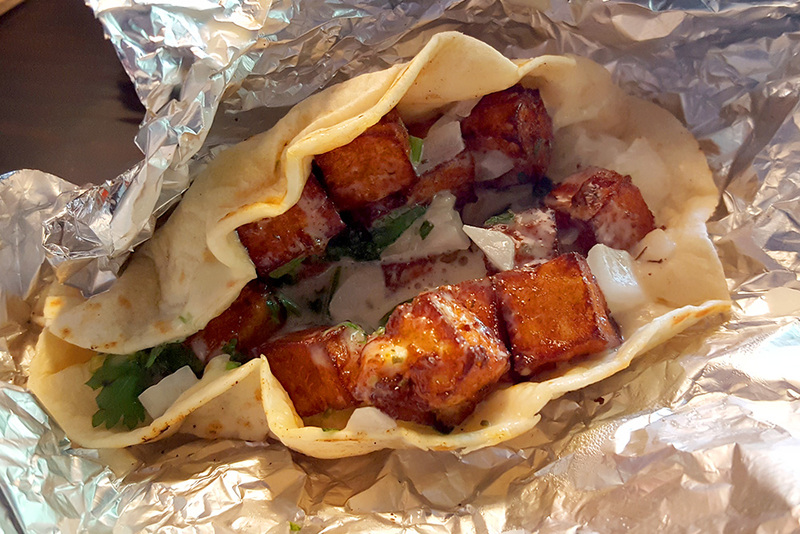 I love Knoxville, and there’s something special across the river that keeps getting better, and—thanks to the SoKno Taco Cantina—tastier, too. Sun.-Wed.: 11 a.m.-1 a.m., Thu.-Sat. : 11 a.m.-2 a.m.
Dennis Perkins' Home Palate is a tasty exploration of local options for eating out and eating well by way of restaurant reviews, features on fun or unusual foodstuffs, and interviews with local food purveyors and tastemakers. 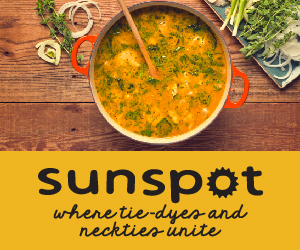 It’s a candid and personal look at what’s right (and sometimes what’s wrong) with eating in Knoxville and its environs. 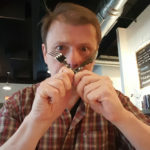 He is also the artistic director of the Knoxville Children’s Theatre, has directed and performed at the Actor’s Co-op and Black Box Theatre, and is a foodie par excellence.